North Korea’s enigmatic young leader, Kim Jong-un, made an unannounced visit to Beijing, meeting with President Xi Jinping weeks before planned summit meetings with American and South Korean leaders, Chinese Central TV reported on Wednesday. The visit amounted to Mr. Kim’s international debut: It was the 34-year-old leader’s first trip outside North Korea since he took power in 2011, and his first meeting with another head of state. The surprise discussions added another layer of complexity to the rush of global diplomacy around North Korea’s nuclear weapons program. The scope of the discussions in Beijing was not clear, nor was it clear which side initiated them. But the visit suggested that Mr. Kim values or needs China’s approval — and possibly its advice — as he seeks to capitalize on a risky diplomatic opening with President Trump after more than a year of tension and threats. Yang Xiyu, one of China’s leading experts on North Korea, said that Mr. Kim was clearly trying to repair the North’s deeply strained relations with Beijing, its traditional ally and benefactor, while opening new ties with its enemy South Korea. 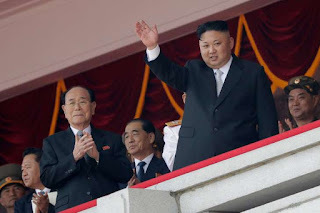 Even so, Mr. Yang said, that did not signal that Mr. Kim was willing to give up his nuclear arsenal, though he has told South Korean envoys that he was prepared to discuss the possibility. Mr. Bolton warned that a pre-emptive strike on North Korea’s arsenal would be a “perfectly legitimate” response to a threat to the American mainland. After months of increasing political and economic pressure, North Korea’s once-defiant tone has shifted dramatically since January, for which some have credited Mr. Trump’s threats of military action. Last month, the North sent a delegation to the Winter Olympics in Pyeongchang, South Korea, led by Mr. Kim’s sister, Kim Yo-jong, and the North’s nominal head of state, Kim Yong-nam. They put on a charm offensive that led to direct talks with the South Koreans, plans for a meeting between Mr. Kim and the South’s president, Moon Jae-in, and then an extraordinary offer to meet directly with Mr. Trump. The meeting with Mr. Moon is set to take place next month on the Koreas’ border, while Mr. Trump is to hold his own talks with Mr. Kim by May, at a site still to be determined. Now, with no prior fanfare, Mr. Xi has become the first major foreign leader to meet Mr. Kim. Their meeting may help ease tensions between China and the North after years of deepening rancor. China supports the international efforts to rein in the North’s nuclear weapons development, but experts say it also wants to keep the North as a stable buffer on its northeast border. Shi Yinhong, a professor of international relations at Renmin University in Beijing, said that despite the recent strains in the relationship, it was not surprising that the North Koreans would turn to China at this moment — one that would be pivotal for any leader, let alone one as untested as Mr. Kim. “Kim Jong-un is now in a most difficult economic situation, and he faces a gamble to meet Trump,” Mr. Shi said. Since Mr. Kim took power after his father’s death more than six years ago, Chinese officials and experts have become increasingly disdainful of him for ignoring Beijing’s entreaties to halt his nuclear weapons and ballistic missile tests. While China has never entirely turned its back on North Korea, it has grown increasingly alarmed by the nuclear tests, which have brought threats of dire punishment from Mr. Trump. Under that pressure, Beijing has backed increasingly stringent United Nations sanctions that have reduced the North’s exports of coal, seafood and other goods to China. Mr. Kim’s Beijing visit underscores the historic bonds between the two countries, forged in shared experiences of war and Communist revolution. China backed North Korean forces in the Korean War of 1950-53, during which hundreds of thousands of Chinese soldiers died. Mr. Kim may be following an example set by his father, Kim Jong-il, in appealing to those ties after a period of tension. The elder Mr. Kim’s first visit to China — in 2000 — also came roughly six years after he took power, and shortly before a planned summit meeting with South Korea. Before then, China and North Korea had gone through years of strain after Beijing established diplomatic relations with Seoul in 1992. There were other similarities between the two visits, including Kim Jong-un’s furtive, unannounced arrival aboard an armored train, which was first spotted at North Korea’s border with China near the city of Dandong. On Monday evening and Tuesday morning, the only evidence of Mr. Kim’s presence in Beijing was heightened security around the North Korean Embassy and the government guesthouse where the delegation stayed, as well as the comings and goings of large motorcades of black sedans and sport utility vehicles with police escorts. Neither China nor North Korea acknowledged the visit while Mr. Kim was in Beijing. A spokeswoman for China’s Ministry of Foreign Affairs, Hua Chunying, deflected a question about it at a daily briefing, saying there was nothing to report. In Seoul, a presidential aide told reporters on Tuesday that South Korea was closely watching “what is unfolding in Beijing.” He added that it was a good sign that North Korea and China were improving ties before the coming summit talks. During his 2000 visit, Kim Jong-il toured Chinese special economic zones, as Chinese leaders sought to show him the merits of opening markets. But current North Korean leader apparently made no such side trips. By Tuesday evening, his train had left Beijing’s central station, headed toward Pyongyang, the North’s capital.